Based on the expected core profit of 170 million yuan for the whole year, the current price-to-earnings ratio is only 5 times. The expected dividend yield is between 4.2 and 6.4%. This valuation is still very underestimated, even though the stock price has risen by more than 60% from the low level, but we Don’t forget that the offer price is 0.5 yuan, and the current price is still lower than the offer price! This entry was posted in Investment and tagged Time Intercon on 29 November, 2018 by Wai Gor. 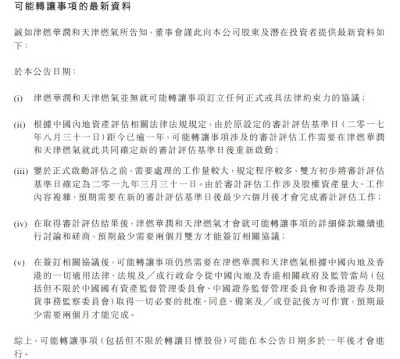 The voluntary conditional offer made by the Taigang (PAG) to Chunquan Trust was finally settled. As a result, the voluntary conditional offer was invalidated because PAG could not obtain more than 50% of the acceptance of the offer, that is, the offer failed, Chunquan’s major shareholder The status remains unchanged, and PAG can only continue to be the second largest shareholder, followed by the Huizhou transaction. If the major shareholders and their alliances remain unchanged, the Huizhou transaction will pass smoothly, and the spring will be passed. Spring will issue new shares at low prices to pay the price of Huizhou transactions, which will seriously dilute shareholders’ equity. This entry was posted in Investment and tagged Orange Sky, Spring REIT on 29 November, 2018 by Wai Gor. Let me briefly talk about the interim results. Revenue increased by 35% to 836 million yuan, gross profit increased by 29% to 184 million yuan, gross profit margin decreased slightly by 1% to 22.1%, net profit increased by 10.5% to 88.4 million yuan, but if one-time gains and losses were eliminated, core profit From 80 million yuan in the same period last year, the growth rate was 20% to 96 million yuan this year, and the core profit per share was as high as 5.2 cents. This entry was posted in Investment and tagged Time Intercon on 27 November, 2018 by Wai Gor.